In stock -This product will ship today if ordered within the next 1 hours and 54 minutes. 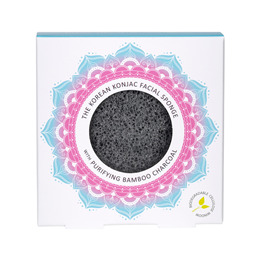 The Bamboo Charcoal Konjac Facial Puff Sponge is packed with mineral rich activated carbon, helps to balance pH levels and deep cleans pores to eliminate blackheads and dirt whilst absorbing excess oils and toxins. 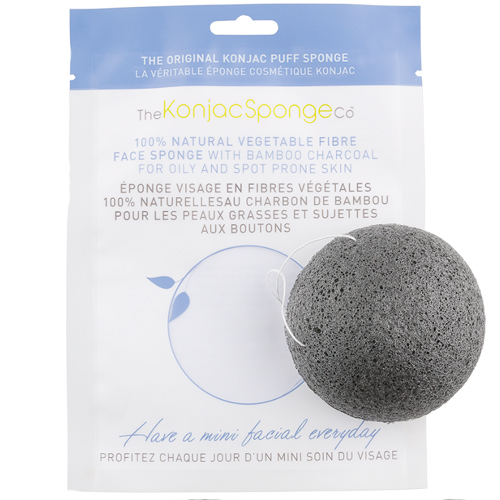 The Bamboo Charcoal Konjac Facial Puff Sponge is additive free, suitable for sensitive skin and removes water-based makeup leaving the skin feeling radiant and rejuvenated. 100% Natural Konjac Fibre with Bamboo Charcoal. Before use, rinse and hydrate your Konjac Sponge in warm water. Squeeze out any excess water, and gently cleanse skin. It is not necessary to use cleansing products, but a small amount can be added to your Konjac Sponge if desired. If a cleanser is added, the sponge will help the product work harder, and go further. After use, always rinse your sponge well, and allow to dry in an airy place between uses. Never leave the sponge in the shower or in a pool of water. Your Konjac Sponge is a 100% natural vegetable product and should last 2 to 3 months. Once it starts to look tired and/or breaks down, replace it. The Konjac Sponge can be safely composted or used in the garden to help water your plants by holding moisture. Never leave a child unattended with a sponge. Below are reviews of The Konjac Sponge Co Konjac Facial Sponge - Charcoal by bodykind customers. If you have tried this product we'd love to hear what you think so please leave a review. I normally don't take the time to exfoliate, but having this little sponge around in the bathroom is very handy. I apply my face wash using the sponge in circular movement around my face - it feels gentle but more effective than using one's hands alone to apply face wash. Excellent exfoliant which feels like slathering on cream rather than the usual rough feel. My skin feels so soft after using. Highly recommended. Excellent sponge, gives my face a massage every time I wash, especially when time is limited, highly recommend. I am really pleased with this sponge. I have sensitive skin and it is so gentle that it does not bother me at all.